When I was growing up, I’d sometimes hear my parents’ friends or other grown-ups say things like, “Yeah, we built that house 10 years ago” or “We’re tired of living in an apartment, so we’ve decided to build a house.” At the time, I thought the people in question were, you know, literally building their own houses with their own labor and sweat. Eventually I learned that most people who talk about “building a house” aren’t building anything at all. They’re just paying for someone else to build it. I thought about that recently when I was back-and-forthing on Twitter with a guy who designed a really nice infographic. Only he didn’t say he designed it — he said he built it. I asked him, out of curiosity, why he chose that term, and he said it was just a personal quirk. Fair enough. But the reason it got my attention is that I’ve noticed lots of people who work in digital media using this type of language lately. Some of them, like the guy I was talking with on Twitter, are designers who say they’ve “built” various graphics. I’ve also encountered an increasing number of editors, including some who I work with, who say they’re going to “build” a page for a given article. In any case, the use of “build” by digital designers and editors strikes me as an interesting linguistic trend. I’m not necessarily opposed to it (as I am to the overuse of “rebranding” and “gear” and “sponsorship,” for example), but I do think it’s worth exploring. My take: As fewer and fewer of us work with our hands — a situation brought about by the digital revolution and the long-term decline in American manufacturing — we’ve increasingly fetishized the blue-collar work experience. The increasing use of “build” and its variants reflects that longing for, and appropriation of, hands-on authenticity. If you “design” something, you’re a geek who sits at a computer; if you “build” something, you’re a rough ’n’ ready construction worker who uses steel and concrete and bricks and heavy machinery. Or at least that’s the implicit message. Do I think people who work in the digital realm are intentionally using “build” to make themselves sound more like construction workers? No. But I do think it’s the kind of subtle trend that reflects something larger about where we are — and, perhaps more importantly, where we aren’t — as a society. And hey, it works! The first time I heard one of my ESPN editors say he was going to “build” the page for one of my columns, I have to admit there was something very appealing about it. The editor suddenly sounded like he had all sorts of build-y competencies I hadn’t previously been aware of, and I felt like I was in very capable hands. That’s the seductive power of language. Has anyone else noticed the increased use of “build” in digital settings? Have you used this type of language yourself? Discuss. It’s available in three different black short-sleeve options (two of which come in sizes up to 5XL) and one long-sleeve option (up to 5XL). plus I’ve also made the design available as a sticker. The shirt is available here through 11pm Eastern tonight. My thanks, as always, for your consideration. LAST CALL for the Raiders contest: Today is also the LAST DAY for my ESPN design challenge to redesign the Raiders for their move to Las Vegas. Full details here. Baseball News: Yokohama Stadium in Japan, home of the Yokohama BayStars, will be using a bullpen car this season (rare non-UNC-related submission from James Gilbert). … Arizona gave its new athletic director a baseball jersey with the wrong number font (from @AZJoshM). … Beautiful striped stirrups — but brutal logo-creeped sanitaries, ugh — for Northern Illinois. White Sox-esque logo, too (from @Barstool_NIU). … The Binghamton Rumble Ponies’ new mascot will be named Rowdy. 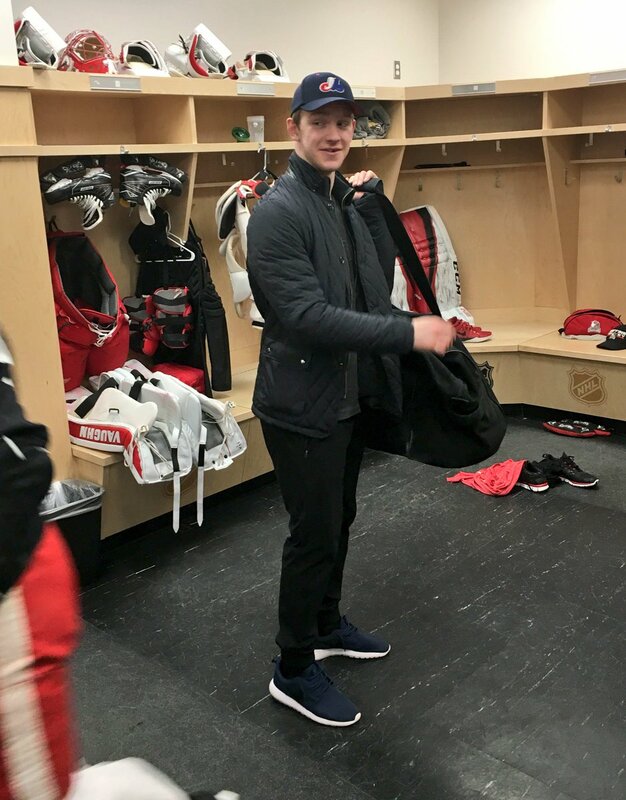 … Recent Detroit Red Wings call-up Evgeny Svechnikov wore an Expos cap in the locker room yesterday (from Philip Dentler). … The Lexington Legends and West Virginia power will become the Hatfields and the McCoys later this season (from @t_rex20_). 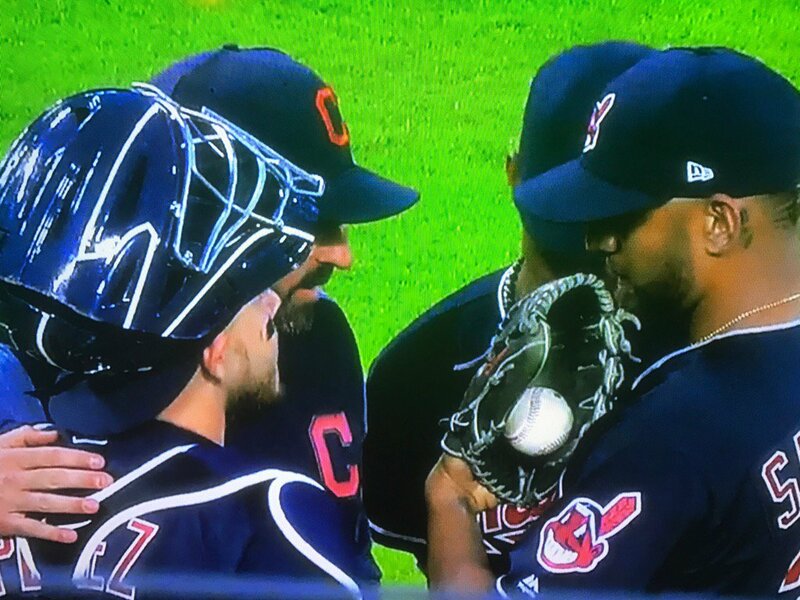 … Cleveland wore their Wahoo caps last night — except for pitching coach Mickey Callaway, who wore the block-C cap (from Joseph Giordano). … The lettering on Mariners P James Paxton’s NOB could use a bit of help. 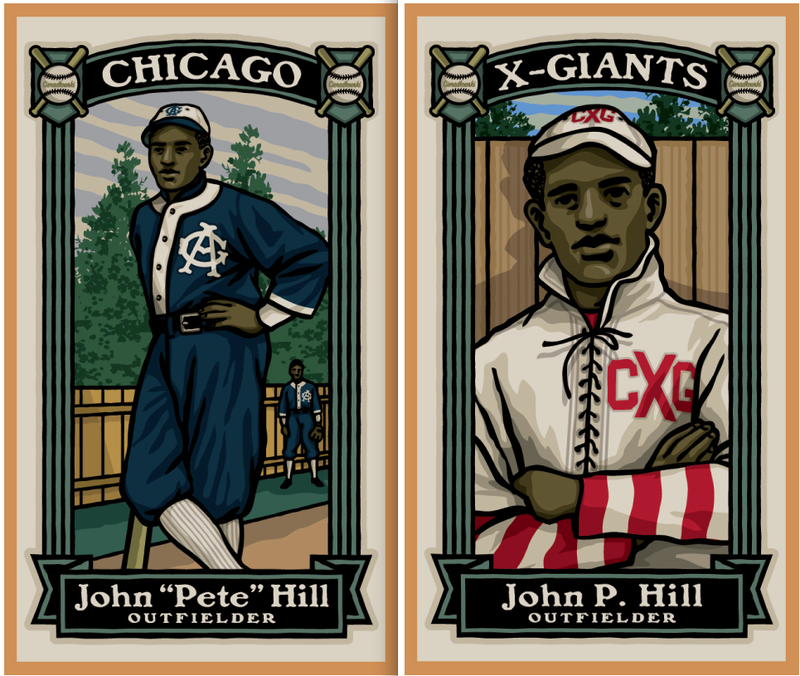 … Gary Cieradkowski, who you may remember as the designer/illustrator behind the excellent Infinite Card Set project, has started publishing a baseball journal called 21, and it’s gorgeous. Great illos, great production values. Good writing, too, including a feature on the 1956 LA Angels’ uniforms. You can see some spreads here, and you can order a copy here. … Orioles 3B Manny Machado has been wearing custom cleats that include Skittles embedded inside the footwear and engraved initials of himself, his wife, and his dog (from Will Shoken). 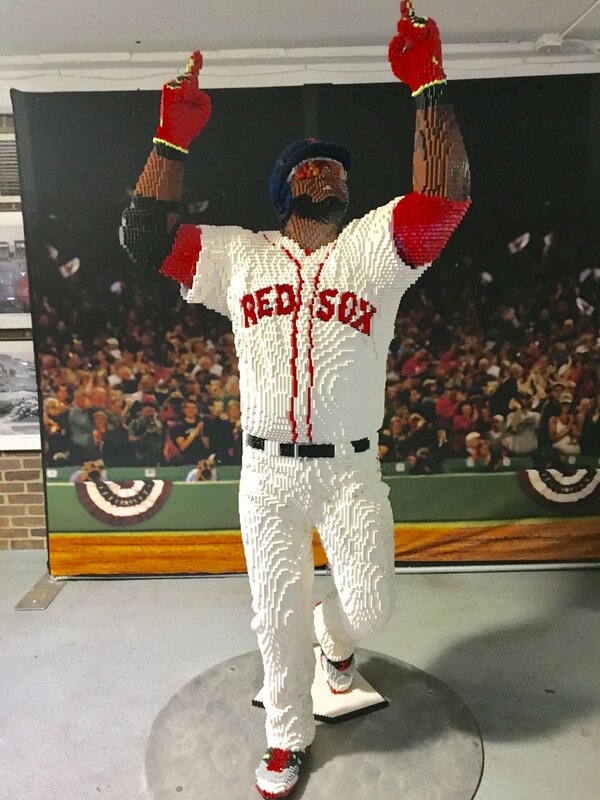 … There’s now a Big Papi Lego statue at Fenway Park (from Robert Brashear). … Those Dodgers socks with the misaligned stripes are back. … The Mets Hall of Fame at Citi Field, which for the most part is a very good facility, is currently exhibiting a badly era-inappropriate Tom Seaver jersey (from Shannon Shark). … Here’s a good view of the Nats’ 3D helmet logo. NFL News: Potentially major news out of New Orleans, where Saints WR Michael Thomas posted an Instagram photo that seems to indicate that the team is finally ditching the neck roll collar. … Rawlings has renewed its licensing agreement with the NFL for tailgating products. Hockey News: Penguins G Marc-AndrÃ© Fleury had to black out the logo on his iTech neck guard to NHL corporate partnerships. Douchebags. … This was in the baseball section, but we’ll put it here as well: Recent Red Wings call-up Evgeny Svechnikov wore a Montreal Expos cap in the locker room yesterday (from Philip Dentler). … It appears that the Czech Republic will wear 1947 replica sweaters — like, actual knit sweaters, not just “sweaters” as a synonym for jerseys — against Sweden in the first period of a game during the Carlson Hockey Games. Close-up photo here (from Rob Yasinsac). … Here’s a new one, at least to me: The goalie on Finland’s women’s team complained about the pins anchoring the net at the World Championships (from Tris Wykes). Soccer News: New secondary jersey for the Chicago Red Stars. 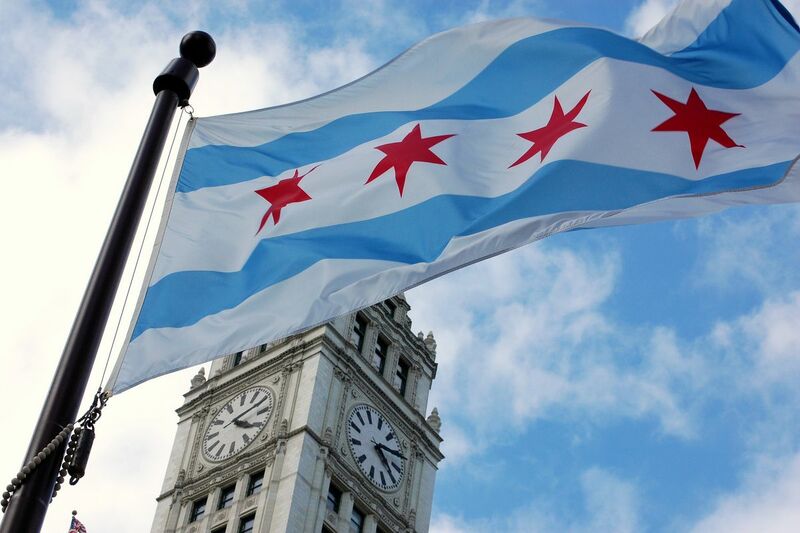 The design is based on the Chicago city flag (from @GuySmileys and Steve Johnston). Grab Bag: New cricket uniforms for Somerset (from Michael Sprake). … Former NFL player Shawn Springs now runs a company that makes lacrosse helmets (from Tommy Turner). … Zachary Hughbanks reports that USA Rugby has inked a new uniform deal with Adidas. “This is the first time they’ve had a ‘mainstream’ company supply their kit,” adds Eric Bangeman. “For the last decade, it has been BLK, Canterbury, and Kooga.” … Here’s what some of the top runners will be wearing in this year’s Boston Marathon. … My friend Tony was doing some vintage shopping and turned up this amazing New York Golden Gloves warm-up top. The zippered sleeves are to allow for boxing gloves! … Some Kashmiri boys were arrested yesterday for playing cricket in the Pakistani national team’s uniforms. … In this interview, the veteran luchador Mano Negra explains how his character was based on the John Carlos/Tommy Smith black glove salute at the 1968 Mexico City Olympics (from Mark Coale). … People attending today’s Honorary Starters Ceremony at Augusta will receive this Arnie’s Army pin (from James Gilbert). A new version of software is often referred to by developers as “a build” which is an interesting case of turning a verb into a noun. If a designer needs a color that is not a Pantone-specific color, then that color is “built” using various CMYK values (or other color formulas). That usage of “build,” for compiling or otherwise making a fresh version of a program, goes way way back – to the 1980s at least, but probably back into the 70s or 60s. So you could argue that it’s a usage that has built organically over time, and has broken through as more and more and more workers (of any color collar) are engaged in digital work. Which makes me say that it’s not the fetishized reference to blue collar labor that you posit. “Crafted,” sure, that one is. That said – it’s totally an in-vogue corporate term that makes you look “smart” in a meeting with non-digital people. Going back to building out my portfolio…. Adding: If the button or command on your software tool that turns the code into a working program is labeled “Build,” then it’s no mystery. Back in the early days of computing, there really was a hands-on aspect to the “building” of a program – punching and stacking the cards used to enter the program into the computer. building software is the step that takes the english like programing language files and converts them into binary code that the computer can actually run. it also links your code against the code of the system it is being run in. building a native application (safari, word, excel, photoshop, etc.) consists of at least two steps, which are compiling and linking sometimes it also includes packaging. so the word ‘build’ relates to assembling the package of parts that make up a complete program or application. so ‘build’ and ‘built’ in the context of a web application or native application is a pretty straightforward description of the process involved in putting it together. The Nats 3D logo is in the Basketball section of the ticker. Is the tagging in the Czech sweaters item correct? In Soviet Equestria, the Pinkie Pie party finds YOU! There’s actually a piece of software called “Page Builder,” so the idea’s not that uncommon. And while a program like that helps to bridge the gap, there’s often a difference between designing something and implementing it, especially if there are technical guts. “Build” is an acceptable synonym for “implement”. “building a case” as a lawyer term comes to mind as somewhere between the digital world and manual labor. Here in Michigan, where we lead the nation in new manufacturing jobs, we DO build a lot of stuff! Digitally, I hear the web folks on my team talk about various design tools at their disposal. Of course, you need tools to build stuff! Then again, I bake cookies using a variety of things that are technically tools — spatula, mixing bowls, measuring cups — but I don’t say I’m building cookies. Which is fine because for some reason I woke up “Bette Davis Eyes” stuck in my head and I wasn’t pleased. Working in web services, “build” is used a lot. I accepted it as the parlance of the job and I don’t think (nor have I ever) thought of it as a longing for blue-collar work. Designing web sites is building in a sense, it’s just rather than using your hands with masonry and tools, you’re using your hands to type in code for a HTML or CSS file on a computer. Still, the usage of that word does make you think, and I appreciate that about your posts. So we’ve seen evidence that both the Saints and Cowboys are going with the new Nike template. Have we heard anything about this happening league-wide, and are more teams changing up their collars? I work for a business that has large complicated software systems and lots of folks here go on and on about the “builds” they have to do, which are really just configuration. A related item that strikes me funny is that people will refer to a form – especially a checklist – as a “tool”. Successful managers also use the term “building a team”, as the first step of a project. While using the hands isn’t involved, other important skills are required. It’s like a football head coach building a roster, most of them played the game at some point. People rarely use the term “building”, to describe something that wasn’t successful. The Big Papi statue (or a duplicate) was at JetBlue Park this spring. The Red Sox had somebody standing by it whose job was to take pictures for people who wanted to pose with it. Chicago Red Stars coming out with another great kit design. They seem to not follow the trend of the Women’s league of generic jerseys. Puts them in the top jersey in Chicago rankings yet again if you ask me. Still kick myself for not buying their blue “waldo” jersey from a few seasons ago. White and light blue stripes, six pointed stars, perfection. Nike is pulling one here with the Red Stars top. That’s the Nike Striped Division 2 template jersey. My kid’s club team has been wearing that same template since last year. That’s a bit of a bummer! Red Stars still have the best overall kit set in the league. Honorary starters ceremony for the Masters is(was) today, not tomorrow, no? As others have already commented, a lot of us in the software industry use “build” for many aspects of our daily job. The compiling of the code into the usable product is typically referred to as “the build”. When software developers/engineers compile locally it’s almost always called “building” around here even though it usually means you press a button and take a break. As a software engineer, when I write code we typically refer to it as “building” the application. We are the ones creating it and filling out the structure and components. Typically “design” and “designing” around here are referring to completely different things – those who mock up and control the user interface portions of things. Even then, the designer is usually just responsible for the look and feel, the person who has to actually implement it is the “builder”. This is exactly what I was going to touch on. I think we use build to distinguish that we actually “constructed by putting parts together”, versus the just doing the initial design step. Buck Showalter wore a hat w/o the new era logo again last night. Given his history, I wonder if this by accident or not? Nothing Buck Showalter does is by accident. Except maybe forgetting to use Zach Britton in the wild card game last year. The Golden Gloves warmup top is gorgeous! That throwback hockey sweater make me think of an old Pro-Line commercial where an owner decided to put his hockey team on the ice in “throwback everything“, and the team gets slaughtered by the visitors because they can’t keep up in their antique equipment, leading to the one guy in the stands who bet on the visitors to celebrate. For those of you not in Canada or who have otherwise not heard of it, Pro-Line is basically what you’d have if state lotteries offered sports betting. The commercial was part of a campaign called “Anything Can Happen”, where bettors celebrated freak sports mishaps that benefited them (another commercial had a mascot’s T-shirt cannon misfire and take out the home team, for example). That’s exactly what happened in the 1972 Summit Series between the USSR and Canada. The Canadians laughed at the Soviets in their wool jerseys and ancient equipment… but then lost the first game 7-3. I can’t tell you how many times and how long online I spent searching for that particular commercial without success. I wonder if “build” might be used so much in the digital realm because so much of putting together a website or “digital platform” or whatever is less creative work than it is repetitive tasks: moving stuff around, formatting images…the web designer’s version of laying bricks and hanging drywall. Also taking into account that multiple people might be involved in it’s construction…a designer, a programmer, etc…further lends to the comparison. I myself never say “I built that illustration”, but I do tend to favor “created” over “drew”, because “drew” doesn’t (to me, at least) encompass the inking and coloring that happens after an image is drawn. Thank you. was about to post the same thing. Real question is, why hasn’t NIKE (who supplies Argentina RFU) stepped up for the Eagles? Adidas will give USA Rugby first rate attention, just behind the All Blacks, France, Italy, All 5 NZ Super teams, and Harlequins and Munster. Maybe we can get the same treatment as the German Team. To me, building and designing are two different skills. Designing is more planning, sketching, refining, and otherwise forming the set of characteristics that describe what a thing will do and how it is going to look. Building is basically bringing the “design” to life, whether digitally, or as a tangible two- or three-dimensional object. If you’re an industrial designer creating products, you might call that fabrication. If you’re a gallery artist creating three-dimensional work, you might call it installation, but the important distinction is that it is the step that comes after the majority of the planning and experimentation is done, and you’re creating what is, for all intents and purposes, the final product. I think it’s common for a designer to have a preference or focus he or she prefers (designing or building), and as a result, I think there are a lot of people who are better at one than the other. For example, let’s say I need numbers and letters for a jersey (a big portion of my job now). The design phase involves a lot of drawing, planning, editing, setting two numbers together to evaluate, and setting several letters together to make names. The phase that follows constitutes building the digital artwork based on all the designing I just did, and really, the only edits that are made in that phase are to address issues I didn’t predict in the design phase. Digital artwork, code, and the like is built with pieces, just like a house, and there is a marked difference in quality between work built by a skilled person and an unskilled person, also like a house. Even though it’s digital, the level of craftsmanship is still evident in the final product. Good stuff, Andrew. I’m really enjoying all the responses on this one! The Lego Papi statue was on display at Fenway last season also, at least late in the year. We were there for the last series of the season (against Toronto) and our son was stoked to get his picture with it. Maybe that weekend was its debut, it being Papi’s last time in Fenway and all. In any case it’s fantastic. To build something, create something, or even perform a simple task — successfully — requires a process, intimate knowledge of the process, and competence. The only difference between building a house and washing windows is in semantics, degree of difficulty, and end product. The lines begin to blur as the house gets smaller (or reduced to temporary shelter), and the windows get higher, thus requiring more than a bucket and squeegee. Also, i think people also use the word build to denote that something is an original creation. When I had a friend work on a logo for me, he used that word to describe his work and to me it conveyed not only originality but a sense of pride in his work. Especially something digital which one doesn’t use real world materials to create, but requires creativity, skill, ingenuity and time. Does anyone in the MLB front office ever watch baseball? Teams wearing same color uniforms is bad enough, now the regular season? CLE wore dark blue at TEX, wearing their Ranger blue. I think MLB writes uniform regs in the off-season and considers their job done. Baseball uniforms can be sharp, but some games look like players simply don’t care. In a similar vein, one of my pet peeves are media writers who refer to their writing as a “piece.” Not an article, or an entry, or a blog. I feel like they use “piece” because it sounds more noteworthy and tends to imply a more elevated version of an article. I’ve long felt people use the top-sounding terminology possible to inflate their self-worth (not sure it’s even intentional). I’d put “build” in that category…”building” something sounds more distinguished than just “designing.” Same thing with “cinema” instead of “movie,” a “comic” instead of a “comedian,” “gear” instead of “clothes,” etc. I feel like they use “piece” because it sounds more noteworthy and tends to imply a more elevated version of an article. Interesting. What is the typical length difference between the two? Is your daily Uni-Watch entry a piece and your ESPN.com stuff an article? There’s no defined line between the two. And the more I think about it, the more I realize I use “piece” for just about any length of published journalism. But I would only use “article” for something that seems substantial, in terms of length and/or content. At any length, “piece” just seems like a throwaway vernacular term to me — not the higher-status term you’re interpreting it to be. But that’s just my take on things. Doesn’t mean I’m right, or that right and wrong even exist in this context. Language is so interesting! I completely agree with your premise, but I think the distinction isn’t that people use the terminology because it is top-sounding, but because it is trendy. Paul brought this distinction to light in reference to the term gear as well as the term branding. Certain verbiage becomes common parlance even if it is less accurate because it sounds cool, or different, or noteworthy. Use of the term Build seems reasonable. More problematic / objectionable is when those in the technology field uses the term ‘architect’; which is a loaded term (historically and technically) and should by nature and logic be applicable only to licensed professionals in the construction design field. Fully designated architects can only be named as such after passing through a rigorous licensure process following a period of monitored apprenticeship. This title/process exists because public safety issues are at play with physical space construction; and licensed professionals are involved and held responsible. Websites are involved….but not truly built in a way that would require ‘architecture’. I came here to say this. As a recent graduate of architecture school, who is very close to obtaining my professional license and the legal ability to call myself an ‘architect’, this made the job search (mildly) frustrating. If you go to say LinkedIN or a job search website, a good majority of the results when you search architect have nothing to do with architecture at all. Things like ‘data architect’ show up. I felt as if people were using the term, expanding upon the verb build, as a way to seem more official, rather than just saying programmer or software developer. in fact, the AIA actively fights the expanded use of this term; to protect its meaning. In the same vein, this applies to engineering as well. I have a professional engineering license that required quite a bit of testing and experience to get – which now allows me to provide my professional opinion in structural engineering matters. I have seen more and more “Computer Engineers” calling themselves engineers without the computer part and it does drive me a little bonkers. The other misappropriation of a title that I hate is when CAD technicians call themselves “Designers”. To those outside the industry, you might think they are actually putting pen to paper and doing the back-end work required to ensure it is safe, when in reality a lot of them are just drawing off sketches provided to them by engineers. I was going to mention this as well, but from the other side of the argument. I started my career as part of an industrial design group and transitioned to working on large transactional, data-dependent websites and applications. I’ve been doing that type of work for more than 20 years. For many projects I define, design and test “website information architectures.” Many call it site structure definition as it is foundational to a website’s success and potential growth. I have been called an “information architect” or I am responsible for that work on large scale projects. I didn’t coin the term, but it is understood within the realm I work in. I know it’s a loaded term from the AIA point of view, but at no time has someone called me and asked me to design their new office building. Words have different meanings in different contexts and in my world, information architecture or IA is a thing. I do a lot of work in Excel. Putting together really complicated financial models in spreadsheets, cash flows, various cases and sensitivities. I also work with bankers who put together financial models that are an order of magnitude more complicated than mine. They’re invariable referred to as “building the model” even though its entirely in the digital, spreadsheet world. I am pretty positive that the entire NFLl will switch to nike’s new jersey template first featured on last years color rush jersey. Considering the cowboys are selling them on their online store, I am positive other usually conservative teams will make the switch (packers). I’m getting ready build my house. When I say build, I mean it literally. There are somethings I will paying for others to do, e.g. concrete, framing, and drywall because I hate doing them and can have it done faster by others. Digitally speaking, I’ve used the term building for websites and other programming jobs. A friend of mine and I “built” the patient software used by a local hospital network. As long as I’ve been in any sort of programming, “building” has always been the common term for it. Concerning “build”…this is much ado about nothing. The prerogative of someone with their own blog, to discuss something that others find unimportant or trivial. Haha…I can only imagine my topics and rants if I had my own forum. The prerogative of someone with their own blog, to discuss something that others find unimportant or trivial. No offense meant. Of course discussions about uniforms could be considered unimportant or trivial, including my wife when she sees me on this site. Obviously it’s your site and you’ll talk about what you want. At least “building” models or websites involves fundamental building blocks to put together to make something. Either as routine as a “sum up this column of Excel values” or as complex as a whole website. And as long as somebody is still building houses, I’m glad it shouldn’t an anachronistic word anytime soon. Like “dial the number” and “hang up.” Anachronisms which stay in the language as idioms fascinate me. I work in a library and we build Dewey numbers. I wonder if there is a correlation between the increasing use of the word “build” as you’ve noticed it in graphic design settings and the tendency for new logo designs to have a long list of justifications for each little detail. Does it make it more important sounding if you built a logo out a lot of tiny parts as opposed to just coming up with a simple overall design? It is almost like it is used as a justification for why something took so long to come up with. “I had to design all these little parts and then put them together in the final build of the logo” which sounds like more work than “I came up with the overall logo after a few iterations”. When in reality, either way, would take the same amount of time. To me, as a graphic designer, the “building” part of my job is in the quality of the final piece of artwork, which should be constructed so that is suitable to distribute to those who need it. It needs to be tight and clean from a technical perspective, of course, with no extra points and artifacts that even have the potential to cause problems for someone, but there is also a skill to drawing proper bezier curves that affect the appearance of the image as well. Your use of the word “constructed” is really interesting to me. I am an engineer and design bridges that eventually get built out of concrete and steel and for me when I think of constructing (or designing) a bridge I think of finding and taking all those little parts (that already exist in their own capacity) and putting them together to make the final product. I always imagined graphic design much more as a creative product being produced somewhat out of thin air, for lack of a better term. Do you find yourself mixing and matching from an assortment of “pieces” to construct various designs? This is really intriguing to me now! Well, that link didn’t work. I’ve been thinking about this a lot recently as my company just released a product I have been working on for about a year. It’s a dashboard with a series of charts looking at sales and inventory data all delivered in Excel. I have been planning on updating my CV and trying to come up with a a way to describe my work on the project. I definitely designed it, I picked what charts we would use, the colors, etc. but I view that as separate from work I did to make it work. I definitely want to convey what I did in this regard but I struggle to come up with a word that isn’t “built” because my contribution didn’t really use any code. My problem is built is starting to sound buzzword-y. Talking about “building” an infographic doesn’t feel the same as “building” something interactive like software or a website or something physical. I think of build as discrete from create or make, but that seems the way the word is going. When people using the same word in largely the same way to describe things that don’t feel the same I begin to get uncomfortable using that word even in contexts where I believe it to be a fair and accurate usage. While we’re at it, can we stop with the overuse of the word “content”? I’ve never thought about it before, but “Build” makes sense in a more digital context when thinking about creating something using smaller components. I work with a lot of data, and I frequently say things like “build the spreadsheet” or “build the database,” just because I’m using software tools to assemble various pieces of material into a larger thing. “application”. The only problem might be if you run low on “memory” or encounter a “bug” in which case you might need to “boot” your computer again. Those terms, along with “web”and “mouse”, are all found at the user level. Perhaps as computers proliferated into homes and onto office desktops (the furniture kind), the computer/IT folks thought it best to use relatable nomenclature and leave the tech terms behind the scenes. I wouldn’t say that Canterbury is a small supplier. They’ve been one of the primary manufacturers of Rugby Kit for many years, as has been Kooga. I’ll be happy if USA Rugby can get a sponsor on the front of the jersey that isn’t Emirates or Heathrow Express. Adidas is a bonus. At the media company I write for, we’ll often refer to building pieces. For example this morning, my boss asked me to “build out” one of our quizzes by expanding it from 15 to 30 questions. It appears JosÃ© Abreu is still wearing a glossy batting helmet, but with a 3D logo. In it’s basic form “builds” are elements created, collected, compiled and connected. However, calling it a “creation” is too singular. Art elements are “created”. A “collection” sounds like a box of stuff. A “compilation” sounds too loose and not functional. I do know that architecture and construction metaphors are used all the time in software development. I like using kitchen metaphors … ingredients, recipe, mixing, chopping, baking and … dish. As a matter of fact, I’m waiting for an artist to chop up an ingredient so I can bake this dish. The info on Fleury’s neckguards/collars is incorrect. The NHL doesn’t allow logos on neckguards/collars, and hasn’t in many years. Also, Itech (the blacked out brand name) was bought out years ago by Bauer. Bauer doesn’t pay the NHL licensing fee for the Itech name. And Fleury is otherwise sponsored by rival CCM. Terry Francona regularly wore the block C cap during spring training instead of the spring training cap. Wonder if this is something the entire coaching staff is now doing? Related to the block C, the official road cap and team logo, it wasn’t worn during postseason and it, and the road grays, haven’t been worn yet this season. The last thing I “built” was a Sputnik lamp out of plastic beer cups. 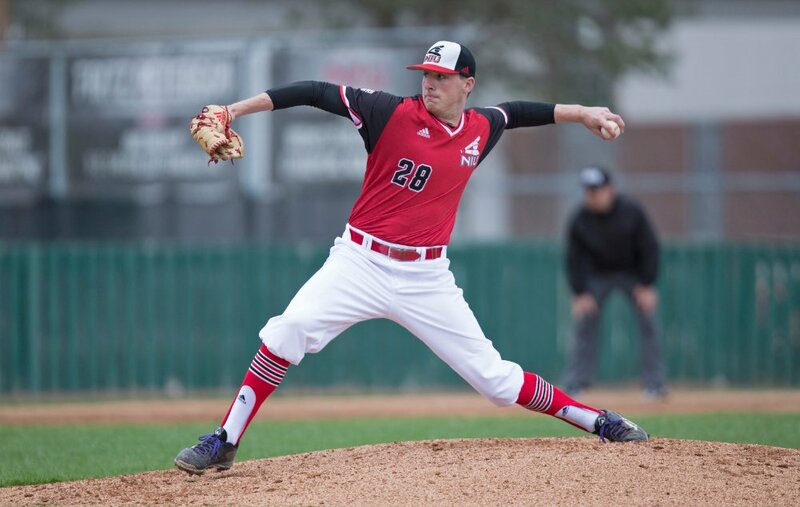 Regarding the NIU pitcher wearing the beautiful stirrups, shouldn’t the belt match the shoes?